Description: Not 100% certain but I think this is loads departing Fairlane plant southbound. Description: These signs are being replaced with CN decals. Description: An empty raw taconite train passes through Iron. Description: Empty T-Bird returns to Thunderbird Mine through Wolf. Description: DM&IR SD18 rebuild 308 is 4th out in the consist of the 203 North. Description: Loaded iron ore from Fairlane to Proctor. Description: With a friendly wave from the conductor rolls the empty ore train through Munger. 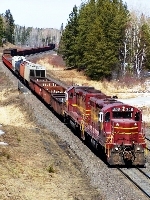 Description: A consist of three maroon Missabe units on a road train departs Proctor for Minntac. Title: Close but no cigar. Description: A northbound CN trains engines duck behind the tree as a southbound ore train rolled by. Description: One of three remaining SD-M's on the roster. Description: The Keenan Switch (with two of the remaining SD-M's) rounds the wye at its namesake location. Description: The Keenan Switch passes through Iron Junction. Description: Loaded crude ore train rolls to U-Tac for unloading. Train is lead by one of the three remaining former Missabe SD-M rebuilds. Description: Roster photo of the last SD-M running on the ex-DMIR. Description: The very first train I see at Iron Jct. has the last SD-M operating on the Keenan Roadswitch. What a way to start the vacation! Description: The Keenan Roadswitch heads back to Keenan Yard with the last Missabe SD-M operating. 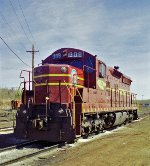 Description: DM&IR 308, the final SDM that remained active on the Missabe, assists sister unit 403 with an empty heading into Adolph, MN. Description: DM&IR SD40-3 and SDM 308 pick up speed near Munger, MN.